A projector is a great affordable way to get a big screen experience in the comfort of your own home. And you can get this experience even if you’re on a budget. 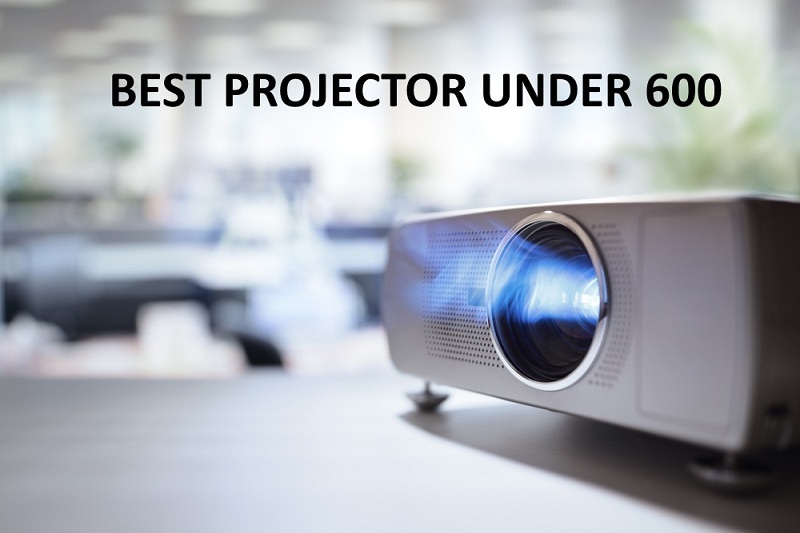 If you’re looking for the best projector under 600 bucks, you might be surprised by just how much quality you can get for the price. Not every projector in this price range is going to give you the picture quality you’re looking for. When you’re shopping for a projector on a budget, it’s important to pay close attention to just what the projector is capable of in terms of brightness and resolution. Want to learn more? You’ve come to the right place! We’ll break down what you need to look at in an affordable projector and review four of our favorite contenders. You want to make sure to look at the stats of projectors in this price range. The unfortunate reality is that if it seems too good to be true, it probably is. You will need to make some compromises compared to what you’ll get with a more expensive projector. The key to getting the best bang for your buck is to figure out which features you actually need, and which you can do without. Some things, like 3D or wireless capability, are easy for most people to let go of since they won’t affect your typical viewing experience. There are 3 stats you’ll definitely want to pay attention to, though, no matter your price range. Measured in lumens, this is an indicator of how much light is put out by the lamp. If the lamp is too dim, the colors will look washed out and the image will lose clarity. You’ll also need to think about your space when you’re looking at the brightness. The more ambient light is in the room, the higher the brightness will need to be to get the same picture quality. For a completely dark room, you can get away with a brightness of 1,000 to 1,500 lumens. In a normal living room or conference room, though, you will need more lamp power—at least 2,500 lumens, although 3,000 is even better. The throw ratio is a measure of how much distance between the lamp and screen is required to get a screen of a given size. A short-throw projector can give you a screen of 150” or more from just a few feet away, while a standard projector will need to be at least 8-10 feet from the screen to produce a large image. Screen size isn’t the only thing affected by the throw ratio. The further the lamp is from the screen, the brighter it needs to be to get the same image quality. Therefore, a projector with a short throw ratio can get away with a lower brightness. The native resolution of a projector tells you how many pixels the screen image will have. Similar to the resolution on a television, a higher resolution gives you a sharper, more detailed picture. A resolution of 1080p is equivalent to standard HD on a flat-screen TV. You might see two resolutions listed on a projector’s stats: the native resolution and the supported resolution. The native resolution is the highest image quality you’ll get in a projected image, even if it supports a higher quality. If the projector supports 4K but has a native resolution of 1080p, this means it can play 4K content, but it will look like 1080p on the screen. Here’s an excellent option for all your projector needs. The Epson EX5260 is capable of projecting high-quality text and presentations as well as the video content you’d view on a home theater projector. This versatility makes it a smart buy for those who want a projector for both personal and professional use. We have two points of hesitation with this projector. The first is that it doesn’t include wireless out of the box like the packaging implies. You’ll have to buy the Epson wireless adapter to use it, and at a cost of about $100, that’s no better than simply buying a wireless dongle. The second is that it’s pretty sensitive to jostling and impacts, which makes it better for permanent installation than as a portable projector. These quibbles aside, the Epson EX5260 has a fantastic picture quality. The lamp brightness can compete with even relatively well-lit rooms, and the set-up is a breeze. For ease of use and picture quality, you won’t find a better option in the price range. You definitely wouldn’t expect to get 3D capability from a projector in the under-$600 price range—and that’s just the first way this Optoma model will surprise you. It also gives you a bright lamp, high contrast ratio, and high color accuracy. In short, it’s your answer to setting up a high-quality home theater on a budget. Our only quibble with this projector in terms of operation was that the lag time felt a bit high. It’s not too noticeable when you’re selecting content to watch, and it doesn’t affect you at all when you’re viewing. It does make the projector unsuitable for high-speed gaming, however. If you’re mostly using the projector for movies and TV, this Optoma is an exceptional value. It gives you a high picture quality in a relatively compact and lightweight package that’s easy to install and set up. The brightness and contrast ratio aren’t the best in the industry, but they’re plenty good enough for most viewers (and impressive for the price range). If you’re working with relatively small viewing space, you’ll need a short throw ratio to get the massive screen your projector promises—and that’s not something you’re likely to find for less than $600. Enter the Epson Home Cinema 1060, which gives you a short throw and a high picture quality at an excellent value. The 3,100 lumens this projector gives you is plenty for most home spaces. Even if you’re contending with large windows in your viewing space, this projector can give you a viewable picture. The flip side to this is that the dark regions of the screen do look a bit washed out, though you can adjust this easily by turning down the brightness if your space isn’t as well-lit. Overall, we’d call this the best home theater projector if you’re contending with a less than ideal space. The combination of advanced keystone correction and a short throw ratio make it easy to place in any space, while the brightness and resolution make it usable even in bright light. Finally, let’s look at this gem from BenQ. They’re one of the top names in home theater projectors, so it’s a bit surprising to find an entry from the company in this price category. While it is their budget model, it definitely outperforms your expectations for a low-cost alternative. The picture quality is what really shines here. It has a very impressive brightness of 3,600 lumens, along with a high contrast ratio. The colors are vibrant and accurate, too, and the clarity is high enough for text-based presentations. You also get comprehensive options for adjusting the picture’s placement and centering, including adjustable feet on the bottom and a manual keystone adjustment. This BenQ does have the smallest maximum screen size on the list. It’s also not ideal for small spaces—you’ll need 12 whole feet of distance to get the screen to its 120-inch maximum. If you don’t have any space constraints, though, this is arguably the best picture you’ll get for the price. As you can see, there’s no one option that’s the hands-down favorite. All of these projectors have their strengths and weaknesses—but all of them can be the right one for a certain kind of consumer. Figure out the demands of your particular space and use those to make your ultimate decision. You might be surprised by the kind of home theater set up you can get without blowing your budget.